As much as we would like our things to last forever (except for our Tim Horton’s coffee because we just love going to Tim’s) it’s inevitable that eventually stuff is going to start breaking down – especially when that thing is as high-tech and costs as much as a surgical table. Fortunately, there are some telltale signs you should know that will help you identify when your surgical table has reached a point where it needs some TLC. In this article, we’ll tell you what those are, in addition to your options for replacing your broken table. Look for excessive movement in the tabletop – rotational, laterally and end-to-end. First, try it without a patient on the table. Then, observe it with the patient on top. If you get lots of drift or play in the tabletop, this is a likely sign of mechanical wear. On the other hand, it could also be aging hydraulics. Do the floor locks go all the way down? Do all of them function or is there one or two that don’t? One common problem with surgical table floor locks is the rubber grip coming off. With the floor locks engaged, do they slip at all? They should maintain their stability. One of the helpful new features on the latest Skytron 6303 table is lights on the base that indicate if the table is secure or not. Sometimes there are hidden oil leaks under the covers. How often does your biomed, maintenance or third party maintenance company look under there? Oil leaks can sometimes lead to bigger problems than what you can only see with your eyes. There’s a couple of things to check here. For example, you have the hand control to check, but you also have to check the manual controls and controls on the table (if applicable). Another thing to confirm is if the backup lights work on the hand control. It’s inevitable that your table will take its share of abuse from things banging in to it and the rigorous cleaning that happens after surgery. Eventually, you’ll see the outer core start to show signs of wearing down. Exterior finishes are the first line of defense in keeping your table in good working condition. When you press a button on the hand control, you are expecting the result to be a specific action. When the hydraulics start failing, or if there is a bit of a disconnect with the electrical system, that action doesn’t happen the way you expected it to. You might have a hydraulic leak, which is only going to get worse. The last thing you want is the table to break down midway through surgery. These two problems usually require a more in-depth fix, as opposed to a quick visit from maintenance. Does your table make grinding noises when you raise or lower it? Is there a hesitation in the lift or is it smooth and continuous? Sometimes you won’t hear a grinding noise, but you may feel or see that the lift seems like it catches on something or has trouble keeping the same pace (kind of like when your car is misfiring on a few cylinders). Inspect surgical table batteries annually for signs of wear and inefficiencies. If you notice that the table isn’t holding the charge as long as it used to, it might be a sign of a weak battery. Think about replacing the batteries every 5 years. What you don’t want is for to neglect the batteries that they eventually explode. Not a good situation for anyone if they do. You should regularly do a visual check of the table’s power cord. If the cord starts to tear, it opens up the possibility of danger from liquids and potential for electrical fire. During the table’s preventive maintenance appointment, make sure to inspect the cord in more detail. Lastly -and this one is important- check the cushions/pads on the table. Are there cuts and tears? Has tape been applied to them to try and close punctures? Your staff and patient safety is essential – don’t risk the spread of infection by using bacteria laden cushions that are older than an Amsco 2080 (that’s a joke because that model is old and outdated). What are your options for fixing a damaged surgical table? Once your table is slipping down the slope of breaking down, you need to take action. But what actions are available to you, and which do you take? The first question is if your table has any type of warranty. If we’re talking post-warranty, the next question is if the breakdown is one that can be fixed by maintenance or biomed, or if it needs a more specialized technician and/or equipment. More likely than not, these fixes will be one-offs that serve as temporary measures to keep the table in service. On the upside, as long as they’re kept to a minimum, they’re the most immediate cost effective of the three options. Are you tracking how much you spend in repairs per OR Table? In a far, far away land that doesn’t actually exist, there is an OR Manager replacing a broken down surgical table with a new one everytime something happens. Back to reality, especially the one in the Canadian healthcare spectrum, we all know how hard it is to get funding for capital purchases. However, this option is a still a good, long-term solution. Assuming that money doesn’t actually grow on trees, remanufacturing is the go-between option that costs more than one-off temporary fixes but much less than buying new. The upside is that you’ll get your table back in as-new condition with the guarantee from us that it looks and behaves and functions like it did originally, but for half the price of buying new! This is a very solid option for consideration, as you essentially double the life expectancy of the table. 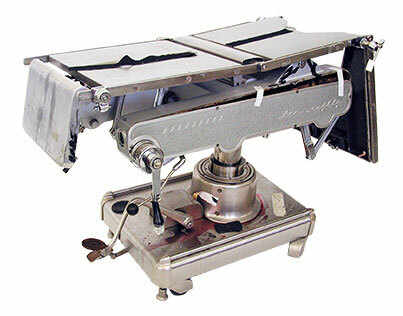 Meditek is Canada’s leading surgical table remanufacturer. Our ReNew remanufacturing program has no limits when it comes to brands or models. We are also the exclusive Skytron distributor for Western Canada for new tables such as the 3603 Ultraslide and the 3503 EZ Slide. Our InSight program gives you a detailed report on the current state of your tables, as well as suggestions for when they’ll need to be taken out of service. Do you know what condition your surgical tables are currently in? Find out with our extensive InSight program. Click the link below to get in touch with a surgical table specialist.